"He entered at once into conversation with me, if I can call it conversation; for it was almost all on his side, and all about himself; and really in a style so vain and silly as to surprise and almost disgust me". (This rather bears out the assessment of Nelson made by Admiral Lord St. Vincent, who was once his commanding officer: "A great captain at sea, but a foolish little fellow on land"). "All that I thought a charlatan style had vanished, and he talked with good sense and a knowledge of subjects both at home and abroad that surprised me equally and more agreeably than the first part of our interview had done; in fact he talked like an officer and a statesman ..... I don't know that I had a conversation that interested me more". Nelson, it appears, criticized the government's plan to send an expedition to northern Germany, suggesting instead a campaign to expel the French from Sardinia, which he thought made more strategic sense and had a better chance of success. An imaginative painting of the meeting of the two great war leaders shows Nelson pointing at Sardinia on a map, to emphasize his point. Neither man is looking at the map! The very next day Nelson left London to join his flagship, H.M.S. Victory at Portsmouth, from where he would sail to find death and immortality at the battle of Trafalgar. 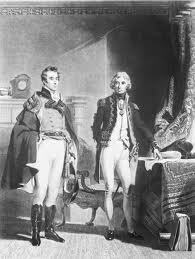 Wellington's great achievements were still to come.In later life he reflected how fortunate he had been to meet Nelson, and, despite the bad first impressions, to realize that "he was really a very superior person". does anyone know who painted this representation of the meeting?